Wall Street On Parade did further investigation of Clayton around the time of his pending Senate confirmation and found that over the prior three years, Clayton had represented 8 of the 10 largest Wall Street banks as a law partner at Sullivan & Cromwell, where he had been employed for two decades. Another problem for Clayton on the Senate Banking Committee is Senator Elizabeth Warren, who is known for coming to hearings armed with a deep trove of facts and statistics on Wall Street’s big, bad banks. Clayton seemed totally unprepared for Warren’s line of questioning yesterday, giving answers that raised further questions as to whose interests he was really representing. Clayton responded that he would be happy to pick any five to seven year period over the last 20 years. 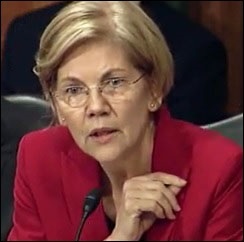 Warren then explained that the evidence shows that the decline in publicly-traded companies is primarily the result of public companies merging and acquiring other public companies. Warren said she hoped Clayton would soon be giving a speech supporting stronger anti-trust enforcement. “But let’s just look at the IPOs, since that has been your focus. You said you want to get more investors involved in emerging companies, which is why you want to see more companies going public. Now in 1996, the peak of the dot.com bubble, there were 624 IPOs with a total of $36 billion in deal volume. From 2012 to 2016, there were about half that number of IPOs but the average annual deal volume was higher than it was in 1996. In 2014, IPOs raised $96 billion, nearly triple the total deal volume in 1996. So, in other words, in the last few years, people are investing more money in IPOs than they did even at the height of the dot.com boom. Senators are given very little time to make their case at these Senate hearings. While Warren has honed her ability to get critical information before the American people in a short period of time, here is what else she could have gotten on the record about Wall Street’s jaded history of rigged IPOs, had she had more time. “First, Wall Street firms issued knowingly false research reports to trumpet the growth prospects for the company and stock price; second, they lined up big institutional clients who were instructed how and when to buy at escalating prices to make the stock price skyrocket (laddering); third, the firms instructed the hundreds of thousands of stockbrokers serving the mom-and-pop market to advise their clients to sit still as the stock price flew to the moon or else the broker would have his commissions taken away (penalty bid). While the little folks’ money served as a prop under prices, the wealthy elite on Wall Street and corporate insiders were allowed to sell at the top of the market (pump-and-dump wealth transfer). 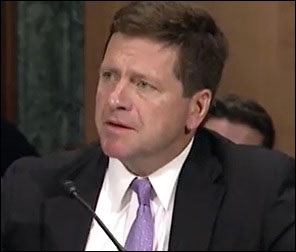 If history is any guide, Jay Clayton will be returning to his lucrative partner status at Sullivan & Cromwell after he leaves the SEC. Does he really want to anger his colleagues at the firm or their Wall Street clients?